First, remember that most cats don’t like to be held for long periods of time. They just prefer the feeling of all four paws on a solid surface. So plan to place your cat on a large chair, a tabletop, the bed or some other sturdy surface for the task. Or you can get down on the floor. Cats also find it uncomfortable to have their feet restrained, so be gentle when holding each paw and quick about the clipping. If things go on too long, consider clipping the front paws one day and the back paws the next day. Cats should be taught to trust trimming from an early age. This is easiest if nails are "pretend-trimmed" by touching the feet and then rewarding the cat with whatever she enjoys: food, toys, catnip, petting or praise. Cats who have no reason to fear claw clipping will also require the least restraint and have the least stress. However, it is a good idea to acclimatize cats to at least some restraint (hugging, holding a leg, applying slight pressure to the toes), again with ample rewards. As for your tools, nail trimmers for cats should be sharp and well-maintained, and designed specifically for animals. Using the right tool will help avoid pressure on and splintering of nails. The soft toenails of kittens can also be kept dull by filing, which is least likely to cause pain or bleeding. When you press gently on the paw pads, the nail is exposed. If your cat has light nails, you can see the nail quick-the sensitive tissue embedded close to the root of the nail. Cut BEYOND the quick, because if you cut into it, you’ll hurt your cat and the nail will bleed. If your cat has dark nails and you can’t see the quick, just cut the tips of the nails where they start to curve. Silver nitrate sticks and cotton balls should be nearby in case you accidentally nick the quick. If you do cause bleeding, don’t panic. Just calmly apply the silver nitrate and pressure with a cotton ball, and wait a moment before removing. (In a pinch, cornstarch will also work.) If there is continual bleeding-which is quite unlikely-contact your veterinarian. 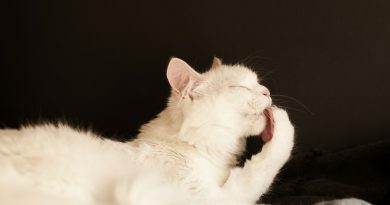 Nail trimming is important for your cat’s health-and your own. If you’re still not sure how to do it, or if the stress or fear of injury is preventing you from performing this necessary task, ask a professional groomer or a veterinarian for a demonstration. ← Is Your Cat Too Fat?